Looking up in the night skies. February. 11, 2019 07:42. .
"The deeper night sat in. 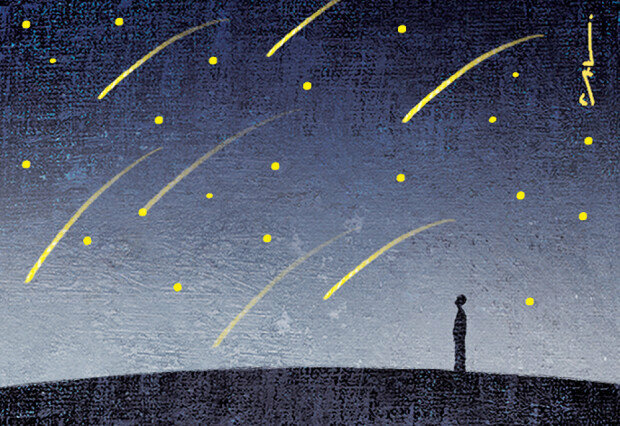 The cascades of stars filled in the skies," French novelist Alphonse Daudet said his book "The Stars," which might have been worn out in a pile of dust somewhere at the study. I could only recall the text dimly but the phrases came up vividly in my memory. The bag of words made me remember the stars in the skies that I saw when I was a child and relieve myself at the thought of having a feeling of affection and love. It was a relief that my life has not been worse than I would think. I had no idea why I was reminded of the novel. That may be because that I have missed the young days when I managed to turn over the page beside the window through which the sunlight came in. The boy has grown old to come into his 40s with little achievement that he has made. His life has been busy with too much stuff. Things have slid a boy who had dreamed of adventure into life full of adventure and ordeal. He has grown as tall as a fence that would be too high for the little boy to look over it. However, he has only become a grown-up who just wishes to manage to handle the daily grinds every day. The story of a little naïve shepherd resonates with people who are struggling in the world of hardship and crisis. Life brings crisis to everyone, whether winners or losers. A series of challenges forces the thought of having to pay passion and effort onto us. Managing life has become a surprise. Then, it may be worthwhile to think of the lucks in the little shepherd boy who looks up the stars in the skies. Despite being unseen, the stars always stay where they shine. As the last part of the novel writes, one of the most beautiful stars that has got lost may come to lean toward your shoulder someday. Let us wish you a miracle in your life and hope you will take further step to welcome it.